IHOP isn’t probably a place you’d expect to eat at if you have dietary restrictions. For many diets, it’s probably not an option. However, if you’re traveling or wanting to try something different, you might be able to find something that works for you. A few weeks ago, our dad sent a text late one Saturday night asking if we wanted to meet to get something to eat. Nikki & I had been out late shopping & hadn’t changed into pajamas yet, so we decided to go. At that time of night, you’re pretty limited on restaurant options. My dad suggested IHOP, so Nikki checked their online menu. At the bottom of the website, you’ll find an allergen menu (on a laptop/desktop, it’ll download automatically when you click on it). The menu is broken down by menu item and allergens. There were a lot of X’s on a majority of the menu. Note: if you have Celiac, be sure to ask how they cook their food and if they have a separate area dedicated to non cross contamination. 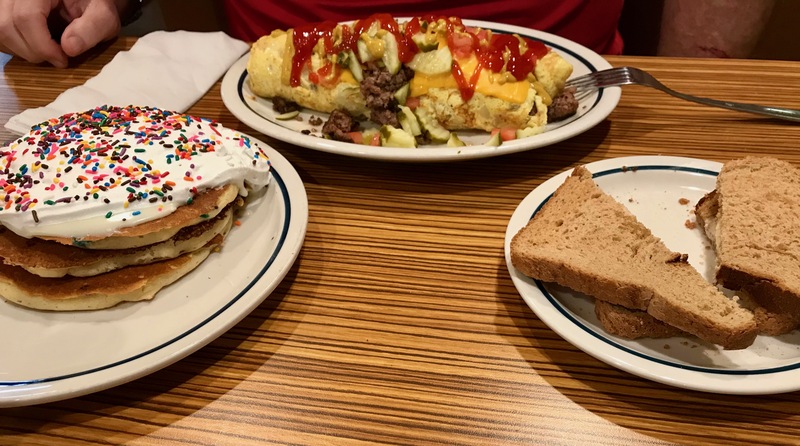 Once we got to IHOP, Nikki asked the waiter her routine questions such as, “what kind of oil do you cook your food in?” Our waiter was really nice and understanding of Nikki’s food sensitivities. He said he had some stomach issues, but ate the problematic food anyway. He also had a friend with food issues. Nikki ordered grits and hash browns. Even though she could technically have bacon, she decided against it since it can occasionally cause her stomach discomfort. Since we knew ahead of time that we were going to IHOP, Nikki brought her own butter. Nikki really liked the food, but she thinks that the hash browns caused some stomach discomfort later. Last weekend, our dad asked if we’d like to meet after an event we were at had ended. Since it was a bit later, we decided to go to IHOP again. Since Nikki had some stomach discomfort after the first visit, she decided to try ham instead. 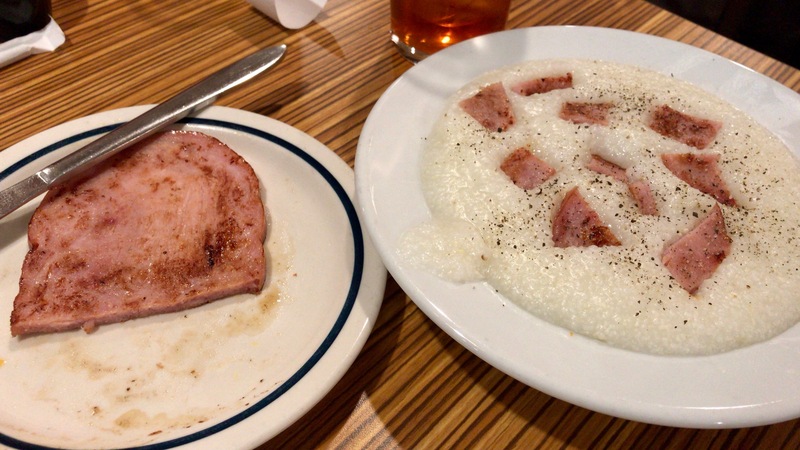 Even though she was butterless, she also ordered grits again. Unfortunately, the ham seemed to cause some stomach upset as well. Ham makes for a good garnish. At this point, Nikki will probably just stick to grits for future visits. For those wanting pancake #foodporn, I didn’t leave you hanging. If you’re going to be jealous of these photos, please begin scrolling now. The first night that we went, I had the Belgian Dark Chocolate Mousse Pancakes. It also came with eggs and bacon. It was really delicious, but I’m kinda mad that I didn’t get the Grinch pancakes (they weren’t on the menu, but it was on the website & I saw an ad for it later). Yes, this was enough for two meals. Give me all the chocolate! Our dad ordered Cupcake Pancakes and a Cheeseburger omelette. He shared the wheat toast with his service dog, Caine. I got to try the Cupcake Pancakes and they’re delicious (he couldn’t finish it all & sent it home with me). 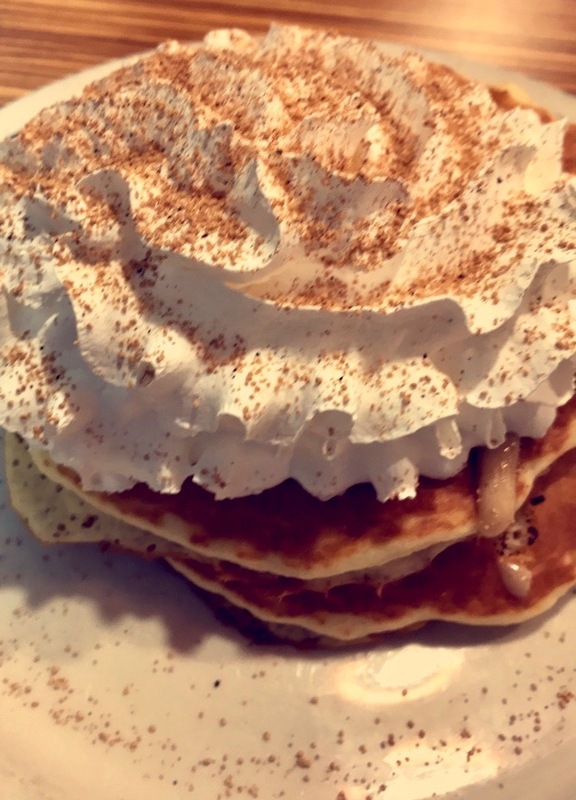 On our second visit, I ordered the Vanilla Spice Pancakes. After seeing (and smelling) mine, my dad decided to order his own. We both really enjoyed these. Even though I’m a chocolate fan, I really liked these. Overall, your options may be limited. 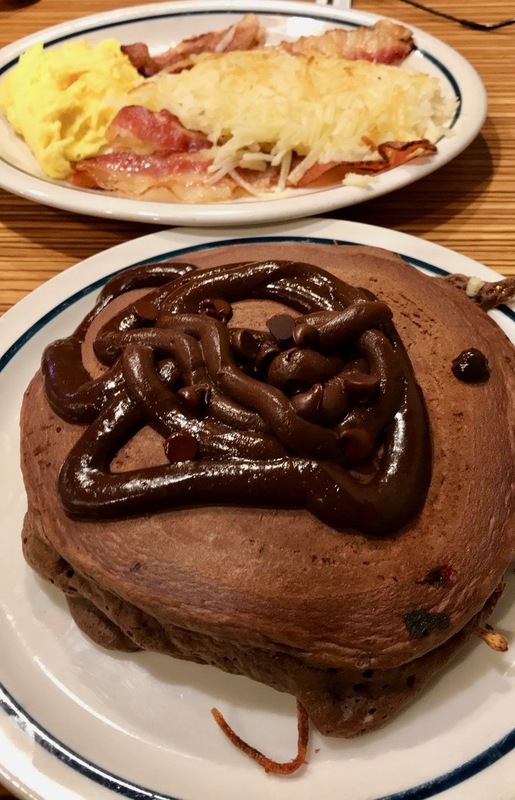 In a pinch with little options, you may be able to find something that IHOP that fits your dietary needs. If you liked this, you might also like to know what to order at Applebee’s, Chick-Fil-A, Red Robin, and Texas Roadhouse. As always, sharing is caring. Stay updated with all things GFS by following me on social media using the handy buttons below. 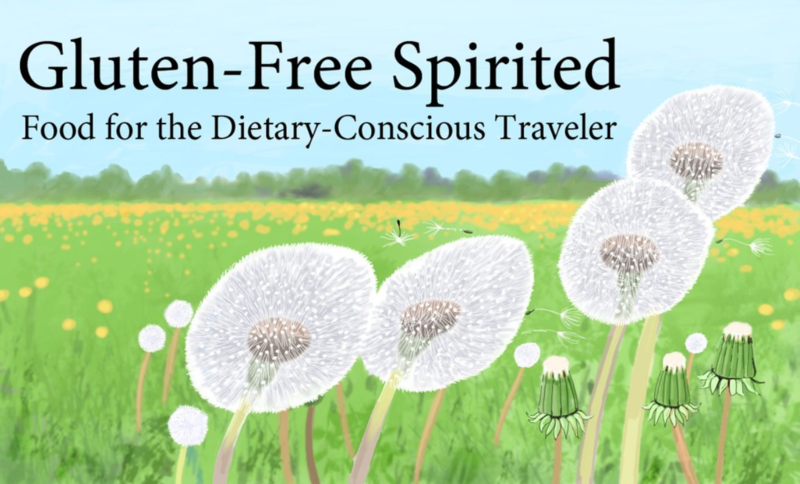 Never miss a blogpost update by subscribing to my mailing list (when you do, you’ll also get a FREE Beginner’s Guide to Dietary Restriction Friendly Essentials Checklist). I’m glad there are some options for people with dietary restrictions. I am also fervently glad that I have none. I do some serious damage at IHOP. So glad that there are more options these days for people with dietary restrictions. My Mum eats GF, so will keep this in mind. It makes dining out so much easier! I think more and more places are now beginning to cater for special dietary needs. It is a good thing as it must be so hard to go out otherwise. I can’t imagine how hard it was even 10 years ago. That’s why we like to share places we find to make it easier for others. I love IHOP! Thank you for the recommendations; you have me craving breakfast already! This is such a handy guide for those with dietary restrictions. I will definitely bear these in mind if I ever visit an IHOP. I’m glad to hear that! I always like sharing info about restaurants with others. We love Ihop!!! my kids do too! I love the mushroom and swiss omelette so good! They have so many yummy options! IHOP is pretty good about diet restrictions. I know I used to get egg whites and other subsutitions. 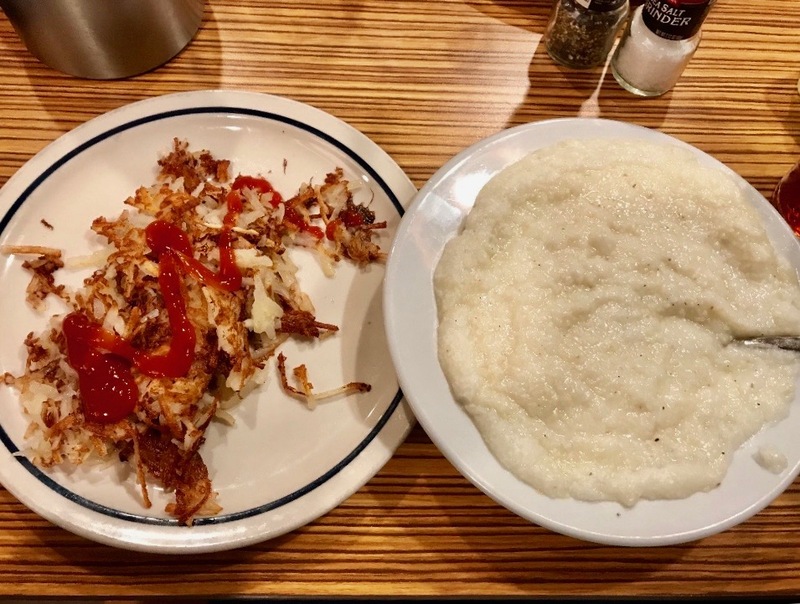 Not many people think of IHOP when they think of restaurants for people with dietary restrictions, so it was a pleasant surprise. Yummy! Looks like you found some great choices. I’m glad more restaurants are offering menus that are gluten free. It makes dining out much easier! It’s great to find new places. Oh my, now you’ve got me in the mood for everything listed in your post! We don’t have ihop in Italy, but I like to visit when I’m in the US. I’m always craving the food I’m writing about. lol They have a lot of yummy options! I am truly thankful to you for this post. This is not only yummy and awesome but has dietary restrictions too. Good for me. I’m really glad to hear that Monidipa! We don’t have IHOP here, but man those pancakes look amazing! I would have never thought that IHOP could meet specific dietary needs like this. I think as more people have them, restaurants have to accommodate. We were really surprised too! It’s nice to have a new place to add into the mix to add some variety.